I can share with you guys my wallpaper collection so far, I have it in a rar. It includes a readme, and it may not seem important, but I would appreciate if you read it. I would include a virus scan but A. I'm too lazy and B. I have an antivirus and C. It's a rar file with a bunch of images in it stop being so paranoid. Scan it yourself. Expires 30 days from the time of this post, I'll reupload when someone asks, as I get e-pestered (I mean 'mailed') whenever a post appears on this thread. Enjoy! Also, if this violates any rules, please remove it, no offense will be taken. Well harrow dere. All I did was grab the wallpaper, edit all of the extra stuff in, then to get the icons anywhere non-grid-restricted, all I did was right click > view > uncheck 'align icons to grid' then place them where I wanted! Wow, have I not posted here in a while. And yes, this IS Windows 7. Using Rainmeter with Elegant Clock & Do I Need A Jacket 2.0. 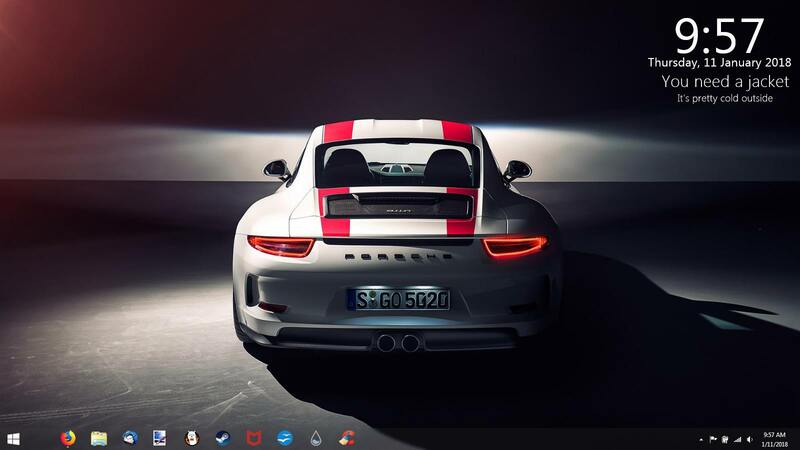 Transparent Taskbar Theme and Customizer God paired with a Windows 10 Start Button. That's pretty. Hopefully, it is silent.